Wedding stationery has be far, evolved a lot over the years. Back years ago invites were a thing rarely seen with invites being given through word of mouth, or even hand written. Now Wedding stationery is a massive part of the overall look of your type of wedding and can say a lot. We’ve been keeping our beady eyes out for some inventive stationery ideas and have come across these eye-catching ideas for your envelopes. Let’s face it, the envelope for your wedding invite is literally only there to cover it and send it: it’s practical and that’s about it. Designed by Sara at Nice Packaging Design (link: http://www.etsy.com/shop/nicepackagedesign) these make a really nice finishing touch to your wedding invites: cute, kitsch and fun. Costing no more than a £5 for minimum of 40 stickers, they are hardly breaking the bank too – the smaller details really do make such a difference. Not only does Sara design these gorgeous stickers, she does a multitude of other Thank you cards, tags for your favours and other cute and handmade style stationery. We think they finish off your wedding invites off nicely. What do you think? Would you use these on your wedding stationery? 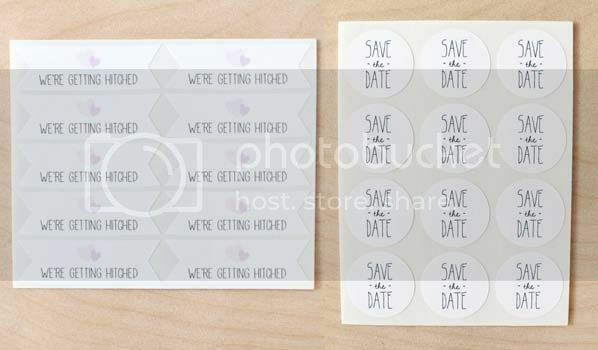 This entry was posted in General Interest, Wedding Themes and tagged cheap, chic, handmade, invitations, save the date stickers, sticker, tags, thank you cards, wedding envelope stickers, wedding invites, wedding stationery.